Wait, wasn’t there a guy in our class named Ray Allen? Just checking. Senkowski wore an earing. Allen wore 2 arm bands. Senkowski played the whole game. Allen only played the second half. Senkowski had Marzilli as a wing man. Allen had none. Senkowski was a Mountaineer. Allen a Husky. Senkowski schooled Marone. Allen dropped out of school. Senkowski had Chico in the stands. Allen had six illegitmate kids in the stands. Mike “Punchy” Senckowski… aka the “hawaiian polack” dropped 39 on the infamous Zach McCall. Did Ray Allen ever play on acid? 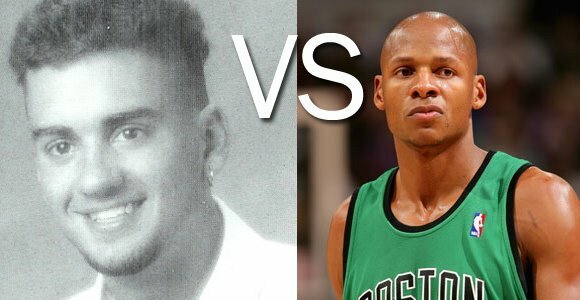 There were times when Punchy was so hot, Courriveau was overheard telling him “look to shot as soon as you cross half court.” Ray Allen needs to come of picks. senkowski was from the calss of ’94. ’nuff said. There was a student in our class named Ray Allen!